The agreement received a mixed reception in the U.S. Adherents of catastrophic man-made global warming theory hailed the agreement, some calling it “a deal to save the planet.” Other observers dismissed the agreement, noting that it is non-binding, is not to be codified in either law or treaty, is unlikely to win necessary political support, and appears intended mainly to buttress the U.S. negotiating position for the U.N. climate conference (COP21) later this year. Partisanship aside, are the goals and timetables set forth in the U.S.-China agreement feasible? In particular, if adherence to the agreement were to become U.S. policy, could the U.S. slash its GHG emissions by 26%-28% relative to 2005 emissions by 2025? This assessment is based on an analysis using historical values and projections of U.S. CO2 emissions from EIA’s Annual Energy Outlook 2013 (AEO2013). As the above table indicates, U.S. CO2 emissions were 5.91 billion metric tons (Bil MeT) in 2005 (the baseline for this analysis). EIA projects CO2 emissions to decrease to 5.38 Bil MeT/yr by 2015 and then increase slightly to 5.50 Bil MeT/yr by 2025. The intended 28% reduction from the 2005 baseline would put 2025 CO2 emissions at 4.26 Bil MeT/yr – 1.65 Bil MeT/yr less than in 2005 and 1.24 Bil MeT/yr less than EIA projects for 2025. Achieving the U.S. side of the U.S.-China agreement would mean generating reductions of 1.24 Bil MeT/yr in U.S. CO2 emissions between now and 2025, in addition to the projected reductions from existing regulatory programs and economic trends. The bar chart below (in which each bar denotes a projection of U.S. CO2 emissions, by sector) shows what it would take to achieve an additional reduction of 1.24 Bil MeT/yr by 2025. Achieving the intended 28% reduction would call for significant emissions reduction in every sector of the U.S. economy, with most of the reductions to be driven by laws and regulations that either are not yet in force or even proposed. Projection 3, another projection for 2025, indicates an additional reduction in CO2 emissions of 0.5 Bil MeT/yr — all in the electric power sector. Projection 3 reflects full implementation of EPA’s proposed Clean Power Plan, aimed at reducing CO2 emissions from existing power plants by about 30% of the 2005 level by 2030. Projection 4, yet another projection for 2025, indicates the additional reductions in CO2 emissions – about 0.74 Bil MeT/yr – needed to achieve the desired 28% reduction from the 2005 baseline. The additional reduction is shown as coming from some combination of all sectors except transportation, by means of as-yet unspecified new CO2 emissions reduction program or programs. 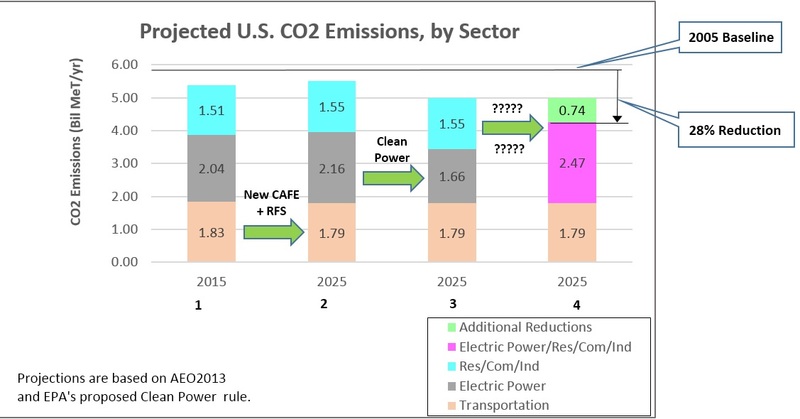 The transportation and electric power sectors seem to offer little additional opportunity over the next decade for emissions reductions beyond those generated by the new CAFÉ standards and Clean Power Plan, respectively — assuming they go into effect as planned. The new CAFÉ standards are subject to a statutory “mid-term” review in 2017. This review could result in a relaxation of the fuel economy standards, as some auto industry advocates call for. The proposed Clean Power Plan is in litigation in the federal courts, which may delay or prevent its implementation. The additional reductions would have to be achieved through either or both of (i) more stringent CO2 controls on the electric power sector (as environmentalists are calling for) and (2) a new set of CO2 controls on the residential, commercial, and industrial sectors. All of these sectors would have to be addressed with new, as yet unspecified, CO2 emissions reduction programs. These programs would have to be in force within the next few years, and they would have to be extremely stringent. The required reduction of 0.74 Bil Met/yr is about 14% of projected total US emissions in 2025, half again as large as the reduction under the proposed Clean Power Plan and almost ½ of total CO2 emissions in the residential, commercial, and industrial sectors. The administration has provided no clues regarding new CO2 control programs for achieving the 28% reduction that would be realistic in social, political, economic, and technical terms. These projections come from EIA’s Annual Energy Outlook 2013 (AEO2013). The projections in AEO2014 are essentially the same in numeric terms. These projections, like all EIA projections, reflect federal and state laws and regulations in force at the time of publication, but not proposed or prospective laws. Thus, the projections reflect the RFS (enacted in 2007), the new CAFÉ standards for cars and light-duty trucks (enacted in 2012), and state regulatory programs established under California’s AB32 – but not, for example, the administration’s proposed Clean Power Plan. The new standards call for 2025 cars and light-duty trucks to have average fuel economies of about 55 mpg and 40 mpg, respectively, with a combined average fuel economy of just under 50 mpg. The projected emission reductions in the transportation sector are small because (i) by 2025 vehicles meeting the new fuel economy standards will make up only a small portion of the vehicle fleet by 2025 and (ii) the new standards do not affect the rest of the transportation sector. 2014 was a year of intense debate – political, economic, and technical – over repealing or revising the federal law and regulations that essentially ban the export of US crude oil. The issue took an intriguing turn on December 30. While the rest of us were gearing down to celebrate the new year, the Commerce Department’s Bureau of Industry and Security (BIS) published guidelines in the form of answers to six FAQs in an effort to clarify federal law governing the export of crude oil and petroleum products. In June of 2014, BIS had issued private rulings to Pioneer Natural Resources and Enterprise Products Partners, enabling them to export lease condensate that (presumably) has been processed in a field-located crude stabilizer. We say “presumably” because BIS has never published its June rulings. After those private rulings, other producers and mid-stream operators requested similar private rulings, presumably based on similar processing routes, and one operator “self-classified” its condensate as exportable. BIS had made no response – until the December 30 FAQs answers. Though stealthy in timing and murky in language, BIS’s FAQs answers may have paved the way for increasing U.S. crude oil and lease condensate exports under existing law. But discerning the implications of BIS’s December 30 statement requires familiarity with the existing law governing crude oil and product exports, the statement itself, and technical aspects of crude oil distillation. What Is the Existing Law? Crude oil is subject to export controls, which BIS administers. These controls effectively ban the export of crude oil (including lease condensate), with some exceptions. Of these, only one – allowing crude oil exports to Canada – is significant in terms of volume. Refined products (including plant condensate) are not subject to export controls and may be exported without a license. Federal law defines crude oil, lease condensate, and petroleum products as follows. Distillation is defined as the process of separating a mixture of components according to their differences in boiling point. What Did BIS Say on December 30 Regarding Crude Exports? BIS’s statement focused on one key question: consistent with existing law and in the judgment of BIS, how much distillation is enough to transform crude oil and lease condensate (not exportable) into petroleum products (exportable)? Here (in slightly edited form) is what BIS says (in FAQs Answer 4) regarding “what is required for liquid hydrocarbons to have processed through a crude oil distillation tower” (i.e., to be deemed a petroleum product). “In order for liquid hydrocarbons to be classified as petroleum products, there must be material processing through a crude oil distillation tower. If there is no processing in the distillation tower, or the processing is de minimis, the liquid hydrocarbons will not qualify as petroleum products. Processes that utilize pressure reduction alone to separate vapors from liquid or pressure changes at a uniform temperature, such as flash drums with heater treaters or separators, do not constitute processing through a crude oil distillation tower. Crude oil processed through such equipment remains classified as crude oil. (6) Whether the distillation uses towers with more mechanical complexity and heat, higher residence time, internal structures that promote condensation and better separation, and consistent quality liquid streams (. . .cuts or fractions) than equipment used to separate vapors and liquids for transportation needs. Remember, I said it was murky. Note that (i) distillation in a “crude distillation tower” is the key determining factor; (ii) all the determining factors are couched in descriptive, non-quantitative terms; (iii) no technical requirements or specifications, such as volumes processed, tower design parameters, or product standards (e.g., RVP, API gravity), etc., are mentioned; and (iv) lease condensate is not mentioned explicitly. What Are the Implications for Potential Exporters of Condensate? Behind the bureaucratic murk, one can discern reasonably clear guidelines for the facilities needed to transform crude oil into material that will classify as exportable. The transformation process must involve distillation in a proper, multi-stage distillation tower with internal structure and internal temperature gradients that produce vaporization and condensation. A flash drum stabilizer won’t do. The distillation tower must separate the crude oil into at least two streams, each of which (i) is physically and chemically distinct from the crude oil; (ii) has consistent quality; and (iii) has a recognized commercial use – Y-grade, petrochemical feedstock, diluent, gasoline blendstock, stabilized crude, etc. – as opposed to merely being an artifact for attaining classification as an exportable product. The separation achieved in the distillation process must be more severe than that required merely to meet standards for transporting the resulting vapor and liquid products. All of these requirements can be met by a suitably designed crude or condensate stabilizer tower or by a condensate splitter. BIS’s guidelines apply to all crude oil, not just to lease condensate. However, market conditions dictate that most of the applications for EAR99 classification will be for field condensate, most of which now flows into the Gulf Coast refining center. For economic reasons, the industry’s interest in exporting crude oil focuses on condensate and ultra-light crudes. BIS’s December 30 publication appears to have opened a route by which U.S. producers can export – under existing federal law – those crude (and condensate) streams that they most wish to export. Our take is that BIS has done as much as it can under existing law to facilitate crude oil exports, and it has done so in a shrewd way. The new guidelines are consistent with and explain BIS’s private rulings for Pioneer and Enterprise. The guidelines are clear enough to indicate to those in the industry what they must do to secure EAR99 classification for their crude oil or field condensate. At the same time, the guidelines are obscure enough to (i) preserve BIS’s role as the gatekeeper for petroleum exports of all kinds and (ii) delay the recognition by some policy makers and advocacy groups that the crude oil export ban is now relaxed. Field-located crude or condensate stabilizers remove light ends components, making the crude or condensate “stable” and thus suitable for transport. 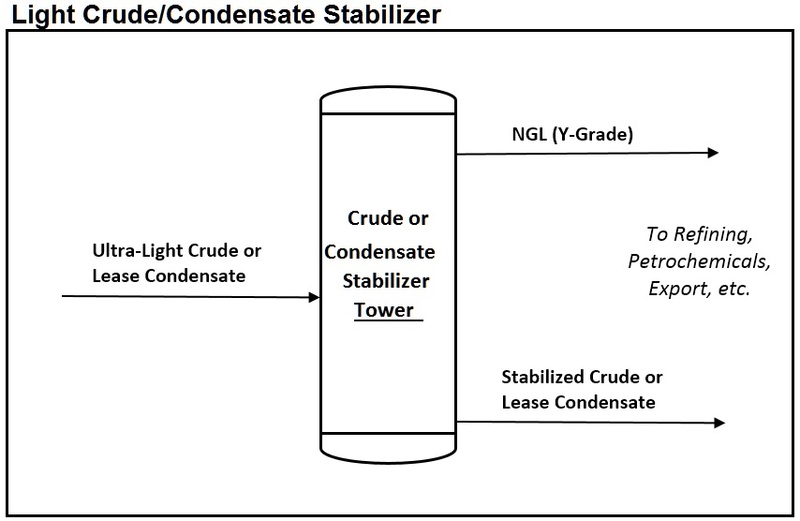 In this illustration, the overhead stream (Y-Grade) would be sold to an NGL plant producing NGL “purity products.” The bottoms stream (stabilized crude or condensate) would be sold to a domestic refinery or exported. In June 2014, the Congressional Budget Office (CBO) published an analysis of the feasibility and economic implications of achieving future annual renewable fuel mandate volumes for the federal Renewable Fuels Standard (RFS). Here in Regulation City, refining industry advocates praised the CBO analysis; ethanol industry advocates trashed it. Elsewhere, the report attracted little attention. That’s too bad, because CBO has made an important contribution to the coming debate over the RFS. EISA Volumes: In this scenario, fuel suppliers meet EISA’s 2017 mandate volumes for total renewable fuels, advanced biofuels (comprising biomass-based diesel and other advanced biofuels, such as sugar cane ethanol). Using the discretion granted it by EISA, EPA sets the 2017 mandate volume for cellulosic ethanol commensurate with the small volume of cellulosic ethanol supply likely to be available in 2017. RFS Repeal: In this scenario, Congress abolishes the RFS. Fuel suppliers continue to use ethanol (and bio-diesel) to the extent economically justified. Of these scenarios, CBO deemed 2014 Volumes the most likely. The mandate volumes specified by CBO for each scenario are shown below. EISA Volumes requires fuel suppliers to use about 9 bgy more renewable fuel in 2017 than 2014 Volumes and about 11 bgy more than RFS Repeal. CBO notes that the supply of cellulosic biofuel (i.e., cellulosic ethanol) has been negligible (< 0.01 bgy) since the inception of the RFS, and (according to projections by the U.S. Energy Information Administration and others) will continue falling far short of the mandate volumes through 2022 and beyond. Biomass-based diesel and other advanced biofuels (e.g., sugar cane ethanol imported from Brazil) cannot offset this shortfall, for both economic and statutory reasons. At the same time, the existence of the E10 blend wall, coupled with the projected decline in U.S. gasoline consumption, means that achieving the renewable fuel mandate volumes would entail increased production and use of some combination of E85, bio-mass based diesel, and “drop-in” cellulosic biofuels. A ≈ 40-fold increase in E85 use – requiring rapid, synchronized, and large increases in E85 production, ethanol logistics capacity, the number of retail outlets offering E85, and the FFV share of the vehicle fleet. The RFS program still seems to enjoy Congressional support, leaving EPA with the task of reconciling ever-increasing mandate volumes with the hard constraints that restrict renewable fuel production and usage. EPA’s struggles are such that it has yet to issue its final rules governing RFS volume obligations for 2014, let alone for 2015 (both now overdue). EPA now promises to issue its final rules covering 2014, 2015, and 2016 volume obligations in late 2015. Perhaps they will. But sooner or later, facts and numbers will force Congress to revisit the RFS program. CBO’s findings are important contributions to that RFS debate – not because they are novel (other analyses have yielded similar findings) or because reaching them requires any deep methodology (simple arithmetic based on subject-area knowledge is all that’s required). They are important because they come from CBO, a non-partisan and competent source of objective information and analysis. These mandates were established in the Energy Independence and Security Act of 2007 (EISA). The mandate volumes apply to renewable fuels, advanced biofuels, biomass-based diesel, and cellulosic ethanol, and increase annually out to 2022. As the table indicates, the cellulosic biofuel and biomass-based diesel volumes are components of the advanced biofuel volume, which in turn is a component (along with corn ethanol) of the total requirement for renewable fuels. “Drop-in” biofuels are biofuels that are hydrocarbons rather than oxygenated compounds (such as ethanol) and therefore can be commingled with – dropped into – refinery produced gasoline without regard for the E10 blend wall. No “drop-in” biofuels are available in commerce as yet. The E85 price decrease reflects CBO’s estimate of the discount against the E10 price that consumers would require in order to be willing to buy E85. E85 could generate these discounts by selling the excess renewable fuel RINs generated by blending ethanol in excess of the renewable volume obligation. On January 31st, the U.S. State Department (DoS) issued its Final Supplemental Environmental Impact Statement (SEIS) for the Keystone XL project. This SEIS, DoS’s third for Keystone XL, refines DoS’s previous analysis in response to nearly 2 million comments submitted following release of the previous draft in March 2013. The headline finding in the Final SEIS is that Keystone XL would have little impact on climate change. Estimated per-barrel emissions of CO2 from the production and use of the oil sands crude that would flow through Keystone XL are about 17% higher than the average per-barrel emissions of CO2 from the crude oils currently processed in U.S. refineries, but only 2%–10% higher than the heavy, imported crudes that the Canadian crudes would displace. The Final SEIS also concludes that no single infrastructure project, built or unbuilt, will alter the course of Canadian oil sands development. Proponents of Keystone XL, many in the business and organized labor communities, are cheered by the SEIS’s findings. These groups continue citing the pipeline’s benefits to the U.S. in terms of economic growth, job creation, national security, and diplomatic relations with Canada. They also state that killing Keystone XL would not stop Canada’s development of its oil sands resources. Opponents of Keystone XL assert that the pipeline, by facilitating use of Canadian oil sands crude, would cause calamitous increases in global emissions of CO2, a greenhouse gas. Climate change alarmist James Hansen’s rallying cry states the position concisely: “If Canada proceeds, and we do nothing, it will be game over for the climate” (NY Times Op-Ed, May 9, 2012). The green community’s response to the Final SEIS has been, on the whole, a little calmer than this but along the same lines. Because the two sides continue talking past each other on Keystone XL, the greens’ assertions of catastrophic effects of Canadian oil sands production and of a resultant imperative to stop such production have gone largely unchallenged, especially in the media. That’s unfortunate, because, on this issue, the greens are dead wrong on the facts. And the key facts can be summarized in three simple statements – all confirmed in the Final SEIS. Production and use of Canadian oil sands crude has and will continue to have minimal effect on total global emissions of CO2. The SEIS estimates that the total “life cycle” emissions of Canadian oil sands crude is 17% higher than that of the average crude in U.S. refineries and 2%–10% higher than that of the imported heavy, sour crudes that it displaces in U.S. refineries. These estimates reflect the findings of numerous detailed engineering studies conducted by reputable and qualified analytical groups. These studies account for the chemical composition (including carbon content) and properties of oil sands crude and for the energy consumed in every step of the crude oil life cycle (production, transport, refining, distribution, and end-use) for all crude oils considered. The U.S. cannot prevent Canada from developing its petroleum resources. The Final SEIS states that no single infrastructure project will alter the course of Canadian oil sands development. Blocking Keystone XL will neither stop nor curtail Canadian production of oil sands crude. The reason is that, given the world’s demand for oil, the Canadian oil sands resource is simply too big to leave in the ground. Alberta’s proven reserves (i.e., oil that is economic to produce with current technology) of Canadian oil sands crude amount to 170 billion barrels, larger than any other country’s except Saudi Arabia and Venezuela. Ultimate total production of this oil is likely to be higher than 170 billion barrels, because reserves tend to be revised upward as development proceeds. Hence, depending on future world oil prices, production of Canadian oil sands crude is likely to generate $15–$20 trillion over the life of the resource. Nothing short of a significant and sustained decrease in global demand for petroleum (and certainly not the wishes of some citizens of another country) will keep that much potential national income in the ground. A pipeline to the U.S. is the most efficient, safest, and least CO2-emitting of all the alternatives for moving oil sands crude to market. The SEIS states that transporting the oil sands crude by rail or by rail and tanker would generate 28%–42% more CO2 emissions than transporting it via Keystone XL. In addition, the SEIS concludes that rail transport likely would involve more oil spills, personal injuries, and fatalities than Keystone XL. These findings are not surprising. Pipelines exist because they are the cheapest, safest, and most energy efficient means of transporting petroleum. If Keystone XL remains unbuilt, the volume of oil sands crude that the pipeline would handle will simply move to market via alternative routes and transportation modes, all having higher energy consumption, higher CO2 emissions, and higher risk of spills and fatalities. For example, oil sands crude could go to overseas markets (e.g., China) by pipeline to East or West coast Canadian ports and then onward by tanker. The crude could come to the U.S. by similar pathways or – more likely – by rail. Indeed, as Canadian producers and U.S. refiners await the Administration’s decision on Keystone XL, rail shipments of crude from Alberta to the U.S. have reached nearly 200 thousand Bbl/day, and rail loading and unloading capacity continues to expand. Whatever the Administration’s decision regarding Keystone XL, the Department of State and the organizations it retained to produce the Final SEIS (as well as the previous drafts) should be congratulated for conducting a comprehensive, painstaking, and objective analysis of an important and highly controversial issue. Some of HD’s most skilled disciples work in public policy. In their efforts to apply to the making of public policy his powerful insight on the uses of language, HD’s disciples sometimes create misrepresentations of fact. One of these misrepresentations is that “renewable fuels” exist, are potentially abundant, and are “green” (i.e., low-carbon) alternatives to gasoline and diesel fuel. These popular misconceptions are the basis for the Renewable Fuel Standard (RFS) of the Energy Independence and Security Act of 2007 (EISA). The RFS requires that U.S. transportation fuels contain annually increasing volumes – reaching 36 billion gallons per year (bgy) by 2022 – of “renewable fuels”. Most of the bio-fuel now being produced in the effort to meet this mandate is ethanol – mainly corn ethanol, augmented by some bio-diesel. Perhaps in the future, some cellulosic ethanol will be produced as well. EISA defines renewable fuel as “fuel . . .produced from renewable biomass [italics added] and . . . used . . . in a transportation fuel.” Unfortunately, EISA doesn’t say what renewable biomass is. For a definition, one must look elsewhere. According to the U.S. Energy Information Administration, renewable biomass is one of many renewable energy resources. These are defined as “. . . energy resources that are naturally replenishing [italics added] but flow-limited [italics added]. . . virtually inexhaustible in duration but limited in the amount of energy available per unit of time. Renewable energy resources include biomass, hydro, geothermal, solar, wind, ocean thermal, wave action, and tidal action.” In other words, renewable energy resources are essentially inexhaustible but capable of producing energy at only low rates per unit of land area. Biomass is plant material, vegetation, or agricultural waste used as a fuel or as a feedstock in the production of a fuel. Hence: renewable biomass is biomass produced in a manner such that is naturally replenishing, and hence flow limited. Biomass is fundamentally different from the other renewable energy resources (e.g., solar, wind, etc.) in that biomass is naturally replenishing only under certain circumstances. Biomass is naturally replenishing – therefore “renewable” – only if it is produced entirely through natural processes and not through on-purpose cultivation (i.e., farming). Biomass produced through natural processes includes materials such as manure, wood slash and brush (used as domestic fuels in developing countries), and non-food plants (such as trees and switchgrass) that grow on uncultivated land. Biomass is not naturally replenishing if it is produced on purpose, as through the industrial agriculture that is practiced in the U.S. and elsewhere. Biomass that is produced on-purpose by industrial agriculture – corn, for example – is not renewable. On-purpose production of biomass requires the consumption of non-renewable resources – mainly fossil fuels (for fertilizer, pesticides, and fuel) and fertile soil (lost through erosion and exhaustion). These non-renewable resources are indispensable to on-purpose biomass cultivation. They relax the flow limitation – that is, the limited production potential per unit of land – inherent in all naturally replenishing processes. The non-renewable resources thereby permit achievement of economically useful yields of biomass per unit of land dedicated to its production (e.g., bushels of corn/acre). Without these non-renewable resources, farmers would have no economic incentive to produce either corn or ethanol derived from corn. Conversion of biomass to bio-fuel (e.g., corn to corn ethanol) and transportation of bio-fuel to the end user consume still more fossil fuels. Whether or not the bio-fuel has positive net energy (i.e., yields more energy when consumed than the energy required to produce it) is immaterial to the question of what is a renewable resource. Biomass whose production requires consumption of non-renewable resources is not renewable. This applies not only to corn ethanol but also to sugar cane ethanol and to cellulosic ethanol. Truly renewable fuels that can be produced in volumes of public policy interest or even commercial interest do not exist, certainly not in the U.S. Bio-fuels that are truly renewable (naturally replenishing) cannot be produced in large volumes because all natural processes for producing biomass are severely flow-limited. For example, corn grown naturally, without cultivation, yields » 10 bushels/acre. By contrast, corn grown by means of industrial agriculture, yields » 150 bushels acre – but through the consumption of non-renewable resources required to overcome the flow limitation of natural processes. None of this is a commentary on whether or not the Renewable Fuel Standard, and the consequent introduction of large volumes of ethanol into the U.S. gasoline pool, is good public policy. On that, time and facts will tell. However, one wonders whether Congress would ever have enacted the Renewable Fuel Standard if its members had understood that – whatever their other benefits may be — the bio-fuels whose production they were mandating are fact not renewable. On March 1, the U.S. State Department released its latest draft Environmental Impact Statement (EIS) for the proposed northern leg of the Keystone XL pipeline. The pipeline would bring crude oil from Alberta to U.S. refining centers in the mid-West and Gulf Coast. One of the EIS’s key finding is that the pipeline’s operation would have little effect on global climate, largely because the crude oil will be produced and exported with or without Keystone XL. Absent the pipeline, the crude would move by rail and/or marine transport to U.S. refining centers and possibly to overseas destinations. The draft EIS is available here. The Bureau of Labor Statistics announced on March 1, the day the reduction in federal expenditures took effect, that it was scrapping three data collection and reporting programs surveys as a cost saving measure. One of the three is the program that tracks and reports U.S. “green jobs.” The BLS published its first green jobs report in 2012. The President’s State of the Union message proposes a number of federal initiatives bearing on domestic energy supply and end-use (i) accelerated permitting for oil and gas exploration, (ii) support of R&D to make natural gas burn cleaner, (iii) support of state initiatives for constructing more energy efficient buildings, and (iv) establishment of an Energy Security Trust, funded by royalties generated by oil and gas production on public lands and waters, to support R&D on commercialization of electric and natural gas vehicles and biofuels. On February 5, 2013, the Subcommittee on Energy and Power of the U.S. House of Representative’s Committee on Energy and Commerce conducted a hearing on American Energy Security and Innovation: An Assessment of North America’s Energy Resources. The subcommittee heard testimony from Adam Sieminsky (Administrator,U.S. Energy Information Administration), Daniel Yergin (Vice Chairman, IHS), Jennifer Morgan (Director, Climate and Energy Program, World Resources Institute), Mary Hutzler (Distinguished Senior Fellow, Institute for Energy Research) and E. Harry Vidas (Vice President, ICF International). Their testimony is available here.